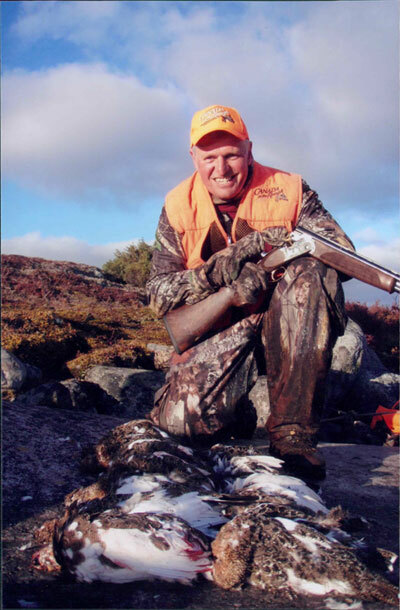 Ptarmigan Hunting High North Outfitting fly-in hunting and fishing camp in Quebec. Upland game hunting in is one of the most unique bird hunting opportunities available to shotgun hunters today. We are offering Ptarmigan hunts over your dog during late September and early October. This is when the birds are starting to form fairly large covies. You will be out, two hunters per guide and one dog per two hunters will be included in the cost of the hunt. Additional dogs can be brought for the minimal charge of the air from Montreal to Kuujjuaq and return. You can take 15 birds each per day and have 30 in possession with a valid game permit. Catch & Release fishing is also available for huge Lake Trout during this same time frame. We can also offer this same package during March from the village of Kuujjuaq instead of from our base camp on Lake Dufreboy. This would be done by using snowmobiles.